Culver City, CA (November 6, 2017) – UCLA will begin construction this month on its new University Extension Headquarters designed by Culver City-based architecture firm, Johnson Favaro. The new administration headquarters will accommodate 450 UNEX administrators, staff, faculty and graduate students. The offices will be divided between spaces in 10960 Wilshire Boulevard, an office tower in Westwood, CA, and the Gayley Center, less than a block away in the heart of Westwood Village, at 1145 Gayley Ave. UCLA’s University Extension (UNEX) program was established over a century ago and is one of the nation’s premiere purveyors of higher education, offering in-person and online coursework for those seeking career change, advanced education or personal enrichment. Angeles, the Santa Monica Bay, and the Pacific Ocean to the south. Glass interior partition systems will be used throughout to capitalize on available natural light. Of the 300 staff members relocating to this space, only 40 senior administration and department directors will reside in private offices closest to the building services cores. Everyone else will occupy work stations for groupings of up to 18 people which are designed to allow for collaboration while minimizing the noise common to old school open office workspaces. Each floor features a lounge, or “commons,” facing Westwood Village and UCLA. On the south side, a two-story room will serve as quiet collaborative work space and on occasion a meeting space for all-hands staff meetings. Break rooms are located at the east and west ends of the building services cores. Enclosed on three sides with floor to ceiling glass, these rooms are almost completely open to the work place and offer views across the floors to the panoramas beyond. Other enclosed meeting rooms of various sizes, designed to accommodate groupings of two to thirty people, are distributed across the two floors in a variety of locations. Most of them are almost completely transparent to the workplace while also offering acoustic privacy. The interior design will reaffirm the organization’s association with UCLA as well as its international impact. Patterned floors and printed overhead vaults in elevator lobbies riff on the imagery of two of UCLA’s most iconic buildings, Royce Hall, and Powell Library. Three walls of the two-story commons are shaped to form a diorama, papered in a panoramic pastoral view of Dickson Court, the heart of the historic core of campus. Some public corridors are lit with a graphic pattern of linear lighting, inspired by traditional brick coursing in which most of UCLA’s historic core is rendered. The floor of the main entrance, reception and lobby is printed with a collage of maps of cities across the world to remind visitors of the lives UNEX and UCLA touch all over the world. The new facility within Gayley is public-facing and customer service-oriented. Four departments of UNEX will move into this space, including the Student and Alumni Services department which serves prospective and on-going students through in-person enrollment, financial services, and counseling. The updated space will include a lobby and reception area that will occupy the 2nd floor. A large opening and adjacent stair will allow visual and physical access from the street entrance to the second floor. 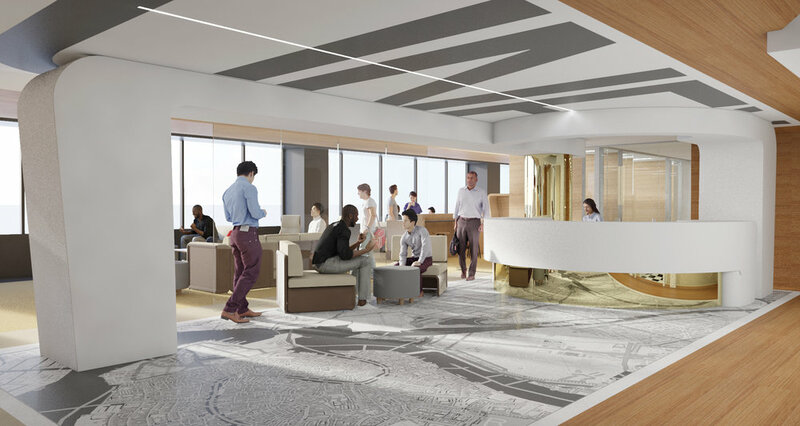 Open office space is located around the perimeter of the second floor, while transparent offices run through the center of the floor, accommodating the Information Technology Services department, Global Services and Cashier and Financial Services. The counseling offices that bisect this work space are nearly entirely transparent allowing views and daylight to penetrate across the width of the floor. Custom printed wall coverings and projected light patterns on floors and ceilings throughout the space reinforce the legibility of the offices and the institutional identity of the organization. This is the firm’s third project for UCLA, having recently completed construction of the Hedrick Study and the master plan for the redevelopment of the Fielding School of Public Health. Steve Johnson and Jim Favaro founded the architecture practice Johnson Favaro in 1988 in Culver City, CA with a commitment to the public realm where they believe architecture has the greatest impact and is most appropriately experienced. For over thirty years Johnson Favaro has focused their work on schools, libraries, civic, cultural and community institutions, both private and public. The firm is founded on the principle that high quality and inspiring architecture in support of the social infrastructure of which these institutions are a part is crucial in the advancement of our democracy and civil society. Current work includes the UCLA Hedrick Study, the Museum of Redlands, Riverside Main Library, a new early education and elementary school in West Hollywood, CA and Southwestern College of Allied Health in National City, CA.